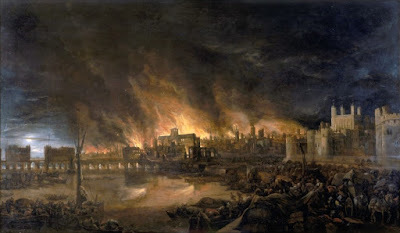 On September 2 in 1666 the Great Fire of London began in a bakery on Pudding Lane, burning for 4 days, consuming 13,200 houses, 87 parish churches, St Paul's Cathedral, and is estimated to have destroyed the homes of 70,000 of the City's 80,000 inhabitants. Panic raced through the streets as rumors of the fire being started by foreigners caused riots and lynchings before the fire was finally contained on September 5th. A 12 meter long scale model of 1666 London, created by American artist David Best, was set ablaze on the River Thames on the 350th anniversary of the fire.